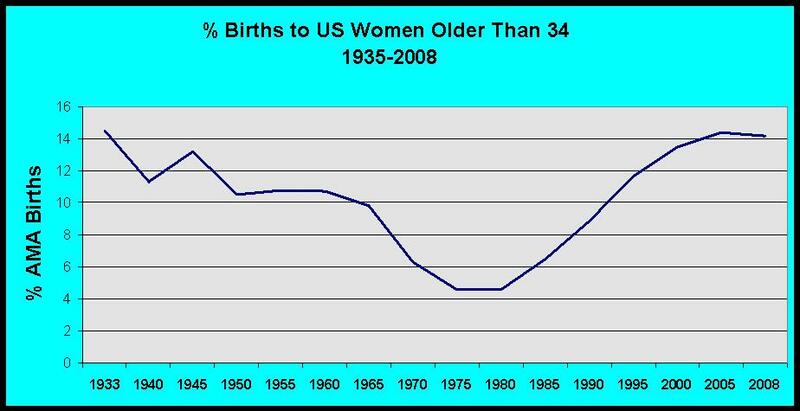 the demographic factors that got us here and then try to figure out where things might be headed. Since about 1980, genetic counselors have been surfing a significant and unrelenting demographic wave – delayed childbearing. The AMA rate (the percentage of pregnancies to women 35 and above) increased virtually every year from 5% in 1980 to nearly 15% in 2008; this pattern is even more pronounced in many Western European nations. We were in the right place at the right time. With apologies to the Beach Boys, we caught a wave and we were sittin’ on top of the world. Incidentally, I have noticed an ever so slight flattening of the AMA rate in the US over the last few years; I am not saying that it’s a close out yet or that we should grab the next ankle buster that rolls in, but we should be keeping our eyes open for a different demographic heavy. The number of women seeking prenatal diagnosis due primarily to their age. The false positive rate of serum and ultrasound screening for fetal aneuploidy, with much higher false positive rates for women over 35, resulting in more referrals for genetic counseling. The number of referrals for infertility, which increases with the age of the parents. More referrals for genetic counseling for breast cancer. Although delayed child-bearing itself is not a hallmark of hereditary breast cancer, it can result in younger age at diagnosis and hence more likely to lead to genetic counseling. The AMA rate also helped to shape the ethos and face of genetic counseling. The Holy Ethical Trinity of genetic counseling – autonomy, informed consent, and reproductive freedom – is worshiped by the largely liberal and progressive AMA population. Not surprisingly, the demographic profile of genetic counselors broadly reflects the patient population they serve, i.e., middle to upper middle class well-educated white women. We have more or less been the socioeconomic, physical, and ethical mirror images of our patients. About 20% of Americans will be foreign-born, which will be greater than the percentage of foreign-born Americans during the great migrations from Europe a century ago. Currently, about 12% of the US population is foreign-born. The percentage of the US population who are Latino or Asian will increase to 29% and 13%, up from 14% and 5%, respectively (to say nothing of the increase in people of mixed ethnicity). What might this mean for the practice and profession of genetic counseling profession? For simplicity’s sake, I am ignoring other factors that can influence the future of the profession, such as advances in medical technology, new health care delivery models, and changes in the economics of medical services. First off, we must increase the ethnic diversity of the genetic counseling profession so that we – and our support staff – reflect the demographic make-up of our patients. This can help overcome significant social and psychological barriers to medical services and improve the cultural awareness and sensitivity of the profession. Perhaps we can take a lesson from Canada, where immigrants already comprise 20% of the population. Secondly, the guiding ethical and counseling principles of the profession must evolve to be in tune with the many and varied beliefs of an ethically and ethnically diverse population. Not every culture buys into the supremacy of individual autonomy, nondirectiveness, or other lofty ethical principles of Western medicine. An aging population means that we will be seeing more patients who are physically and cognitively impaired. The traditional educational and counseling models utilized by genetic counselors may not be particularly effective for this segment of the population. Because it may not be so easy for older individuals to navigate to and around large urban medical centers we may need to increase our presence in alternative medical care settings. From a clinical standpoint, we will also need to be sensitive to new or unanticipated manifestations of genetic diseases. Where do you see the genetic counseling profession in the next 10, 20, or 30 years? What demographic trends do you think are important? How can we best prepare ourselves? What did I miss? Where do you disagree with me? Genetic counseling and prenatal diagnosis are interwoven in a double helix. It is no coincidence that the genetic counseling profession emerged on the heels of the first “genetic” amniocenteses in the late 1960s. Amnio’s and maternal serum screening (MSS) for Down syndrome were the driving forces behind the expansion of the GC job market, fueled by the sudden blossoming of “advanced maternal age” pregnancies that began in the mid to late 1970s and has continued unabated for 30 years. Not only did prenatal testing open up job opportunities, the attendant laboratory, professional, procedural, and overhead fees opened up significant sources of income to medical centers and physicians and provided funds to cover GCs’ salaries. Prenatal diagnosis also offered GCs the opportunity to develop a unique clinical expertise in risk assessment, interpretation of amnios and MSS results, and patient communication that established clinical value of GCs for patients and referring physicians. Yes, I know the counter-arguments. Nobody is forced to have an amnio or an abortion. Parents have their reproductive rights that we unflinchingly support. We all work hard at not trying to consciously influence the routes our patients choose as they travel down the Decision Making Highway. Many of us proudly point to our many patients who have elected to continue such pregnancies. We also fight the good fight for people and families living with disabilities, helping them in their struggles with insurance companies, educational systems, and a complicated and sometimes uninformed medical system. Hooray for us. That is what we are supposed to do. But our protests that we are supporting women’s hard earned reproductive rights rather than implementing an evil eugenic agenda does not change the way the message is perceived. The availability of widespread prenatal diagnosis is based on the assumption that most parents will selectively terminate fetuses with disabilities, an assumption supported by most published studies. As I have pointed out in other venues, the decision to use age 35 or older as the indication for amniocentesis was not based on some mythical figure about the risk of amniocentesis. Rather, age 35 was chosen primarily on economic grounds, i.e., by that age, the societal cost of amniocentesis was less than the cost of caring for people with Down syndrome. Let’s face it – many parents will choose to avoid having a child with disabilities if they can do so, and that is what drives prenatal screening. In the eyes of our critics, GCs play a critical role in the delivery of prenatal diagnosis services, and therefore support the implicit negative message. We are guilty by association if not necessarily by intent. I do not know of an effective counter argument. Either we choose to acknowledge that this is indeed a valid criticism, the world is sometimes a harsh place, and that is a hard truth of living in a world where women struggle to achieve a full range of reproductive choices. Or we pull out of prenatal diagnosis altogether. I do not think the latter choice is likely to happen.